The northern and central regions of Mindanao, particularly in the provinces of Misamis Oriental, Bukidnon, Agusan del Sur, Agusan del Norte, and Lanao del Norte, are the habitations of the Higaonon. 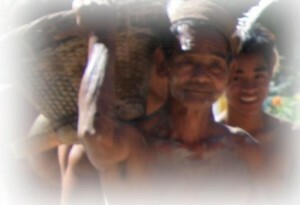 Among all the ethnic groups of the area, Higaonons are the least known. They are described as the “people of the living mountains” and “people of the wilderness.” In fact, their name is derived from higa (to live or reside), goan (mountain), and onon (people). The culture of the Higaonon tribe can be best described as one of peace, for solving the internal conflicts of other ethnic groups. They practice an ancient ritual called tampudas hu Balagun (“treaty of the green vine branch”); literally, it means cutting the vine and symbolically, cutting disputes between ethnic groups. The Bunkatol Ha Bulawan Daw Nang Ka Tasa ha Lana (“Treasured Unity of Love and Peace”) is a code of conduct they faithfully follow, a sacred bond that unites their community.